Perfect selection for the new mom, or expecting friends. The closure of this bib is Velcro to keep the hassle of trying to tie ribbon on the bib while your lovely one is wriggling around. It is made from 100% organic cotton, color is produced with eco-friendly dyes and it is GOTS-certified (Global Organic Textile Standard). Very soft to the touch and is naturally allergen free. You may have a healthy eater like an elephant, but who ways they have to look like they just took a mud bath. This stylish, fun and globally conscious bib is a great way to keep the clothes clean during eating or dry during teething. 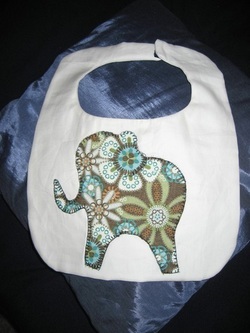 we have many of our baby gear themed around our eco friends, (elephant, rabbit, and lion. Baby booties, pocket pals, eco friends and wall hangings) enjoy checking out our site, and variety of Eco-friendly, sustainable products that are soft and comfortable for your child. When your not quite ready for utensil at the dinner table, bring them with you in another fashion. Soft organic cotton, with velcro closure for easy on and off with no fuss over strings or ties. For your hearty eater, and a fashion statement.